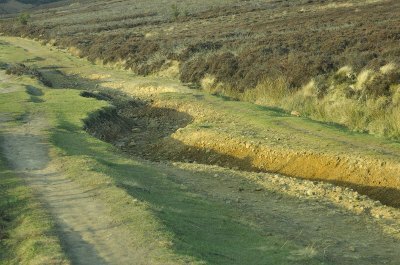 Superb lane across open moorland. Nice ford to finish if you make it to the end. RATING: Starts easy but deteriorates to become suitable for 4x4 vehicles only. 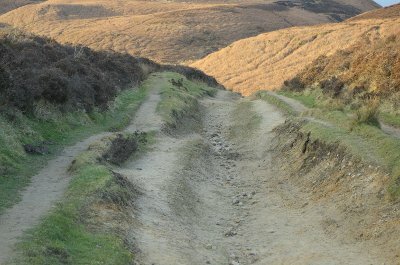 March 2012 and our first day of the year exploring the byways. Earlier in the day we'd taken the rather muddy Ings Lane track near the foot of Sutton Bank. 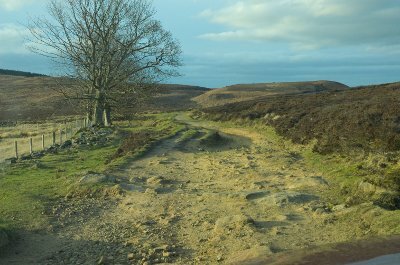 After driving a few other favourite lanes and a trip to Northallerton for a bite to eat, we arrived at Osmotherley on the edge of the fabulous and extensive moorlands of the North York Moors. 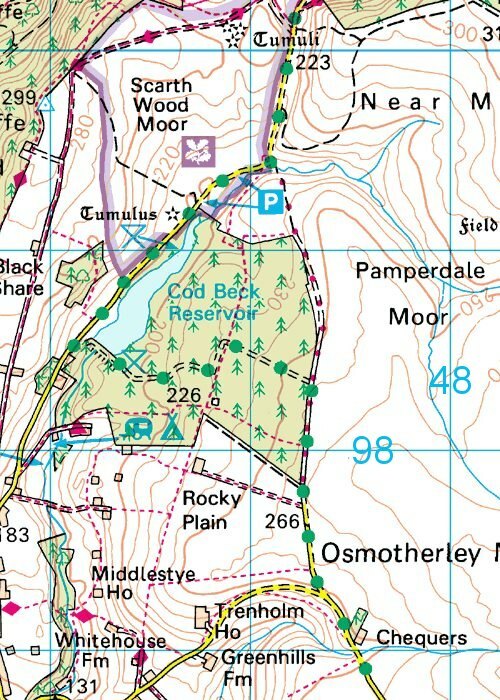 Sadly the 9 mile BOAT that heads south across Arden Great Moor and is still marked on the OS maps is now closed to motor vehicles. However on a previous visit I had noticed an 'Unsuitable for Motors' sign nearby and it was this that we decided to investigate. 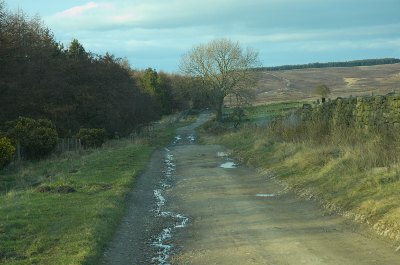 The lane was unsurfaced but driveable with just water filled pot holes on an otherwise dry surface. To our left the pine forest contrasted well against the open moorland to our right and ahead of us. Passing through a gate a sign showed a footpath on the left leading down to Cod Beck Reservoir. 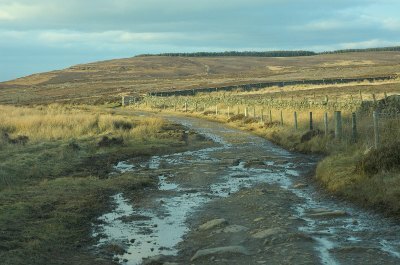 A little further along we left the trees and all around us stretched empty moorland. 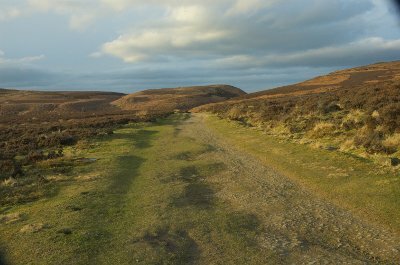 A deer flashed across the moor on our left disappearing quickly into the distance. We continued a little further but the track was deteriorating fast and we soon came to a section that had obviously suffered badly from winter flood water. 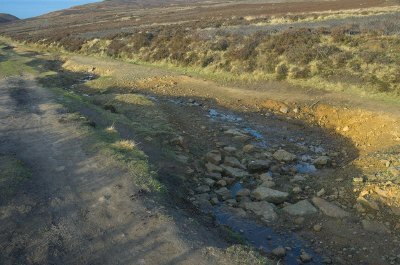 The middle of the lane had become quite a deep chasm making it undriveable for anything other than a 4x4 with good clearance. We continued slowly but decided to check out the road ahead as it disappeared downwards. Sadly we decided that it was just too rocky and rutted to risk continuing with the Discovery and we turned around and returned the way we had come. Maps and Google show a rather nice ford at the end of this lane. Hopefully on another visit we will look to driving this lane again but this time from the Quarry Lane end.